If it happens that MinimumPrice has entered your system, you will definitely notice various advertisements on your screen. They will appear without prior notice, which means that you might click on them accidentally and thus cause harm to the system. It does not even matter which browser you use, all those adware programs based on JustPlug.it engine are compatible with Internet Explorer, Google Chrome, and Mozilla Firefox. Thus, if you decide to stop all those commercials from appearing, you will have to delete MinimumPrice entirely from the system. This adware can be erased via Control Panel; however, if you feel that you need more information regarding the removal process, we encourage you to continue reading the article. 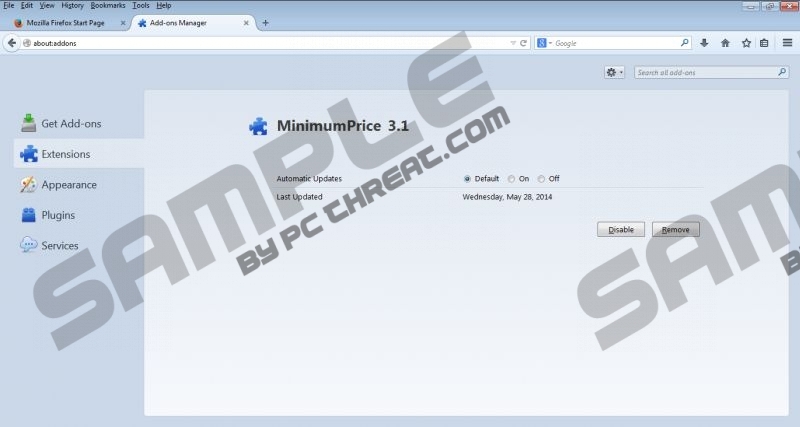 It is not surprising if you cannot remember downloading MinimumPrice because it does not have its official website. Therefore, it can be suggested that this advertising-supported application is usually distributed with a help of other applications, especially those that can be categorized as freeware. In most cases, plenty of unfamiliar applications manage to enter the system due to the careless installation of freeware. Thus, if you want to avoid different kinds of unwanted programs, you should better install new software very carefully. By saying “carefully”, we mean that it is important not to skip installation steps. Besides, it is advisable to select Advanced option during the installation of different kinds of programs. If you have not been able to protect your system from this adware program, you should not click on its ads at least. The specialists of pcthreat.com have found out that you might be taken to corrupted websites after clicking on any of those ads. Nobody knows whether links embedded in them are reliable; thus, you are using this program at your own risk. It is very risky to keep all the adware based on JustPlug.It engine; thus, if you ever notice RoboSaver, EnjoyCoupon, and DownSave on your system, delete them without any delay as well. MinimumPrice is definitely not the application that should be left on the system, which is why we recommend that you erase it. The easiest and quickest method is to do that via Control Panel; however, an antimalware tool, for instance, SpyHunter, will also detect this adware. What is more, it will protect your system from even more harmful threats; thus, it is worth investing in it. Find the program that you want to remove. Right-click on the needless application. Quick & tested solution for MinimumPrice removal.